Purpose: "To oppose evil wherever (they) may find it"
History: (Power Pachyderms#1 (fb)) - While a circus train traveled through the southwestern desert, an ape disengaged the last car, containing a group of elephants, and it took another course on the tracks. The train car then glided through an area where a gamma bomb was set to explode. The now-irradiated train car, with elephants in tow, continued to glide until it met back up with the rest of train and bumped into it, reattaching itself. Several months later, the four elephants on board all gave birth to anthropomorphic elephants. After the circus went out of business, the four children elephants went their separate ways. 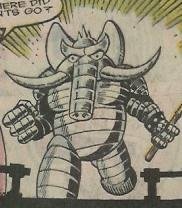 Mammoth traveled to Asia, where he was robbed, Electrolux went to live with a Greek family and worked in their café, Trunklops ended up in an orphanage, and Rumbo found his way to Canada, where he was attacked and left with retractable adamantium tusks by "a friend." (Power Pachyderms#1) - Rumbo and Electralux met again years later when she was searching for the Perfect Masters, who she believed offered enlightenment. The Masters told the two that there were still two more like them in the world, and that it was their mission as a team to fight evil. They traveled to Hong Kong, where they found Mammoth living on the ship HMS Peanut IV, and then recruited Trunklops. Using the wealth Mammoth had found in a treasure chest, they relocated the boat to New York and converted it into a state-of-the-art headquarters. Using their computer system, Cerebella, they tracked down their first adversary, Clarinetto, and battled him and his students, the New Musicians. 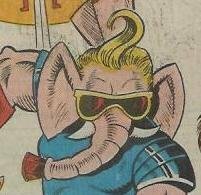 During the fight, Electralux was dumped into a vat of radioactive material, where she mutated into Rogue Elephant. She was returned to normal after Trunklops blasted her with his powers. Realizing that fighting evil was a stupid thing that could have got them killed, the Pachyderms went back to the Perfect Masters and disposed of them, taking their place as the new Perfect Masters. 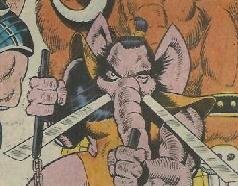 The Pachyderms were as much a parody of the Teenage Mutant Ninja Turtles as they were of the X-Men, showing how things come full circle (The Turtles themselves were parodies of the X-Men). 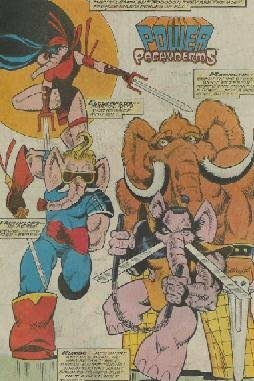 Their origin is a spoof on the Hulk, including evil Russians setting off the bomb, and a Banner-like figure trying to save the elephants, but getting flash-fried instead of gaining super-powers. Why an Elektra parody was included instead of Jean Grey is a mystery to me, maybe they just liked the outfit. 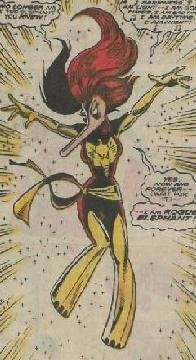 Its also interesting to note she felt an attraction to Mammoth, instead of Rumbo or Trunklops, the Wolverine and Cyclops parodies. Former waitress, well-versed in martial arts. Turned into Rogue Elephant temporarily. Could turn his body into living steel. Very strong. Wanderer, was given retractable adamantium tusks by an unknown party. Could shoot a blast of energy from his trunk, used a ruby-quartz cork to plug it up. 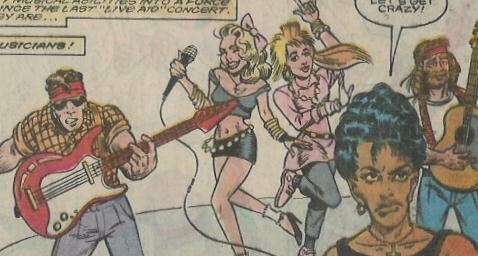 (Magneta) Former head of the Brotherhood of Evil Musicians. Formed another group, The New Musicians, to follow him. Opposed by the Power Pachyderms. Played wind instruments as weapons, including using their music to animate guitar strings. Five celebrity impersonators who followed Clarinetto and battled the Pachyderms. The five resembled Willie Nelson, Madonna, Bruce Springsteen, Prince and Cindy Lauper. 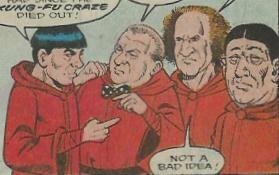 (Shlep, Shmoe, Spritz, Shtick) Four enlightened beings who gave the Pachyderms their purpose, but were replaced by the Pachyderms when they realized they didnt like being heroes.